It's time for some fun! Previously only working as a difficult to use Toy Box only game, this PC version overhaul comes out swinging with access to the entirety of the full game. Because it is a PC download, there is no starter pack you have to go out and buy. Instead they have released the "PC Shop" where you can unlock access to various characters and play sets on your Disney Interactive account. What you get with the free download is still a pretty hefty amount, and will at least let you try the game before you go out and purchase it for one of your home consoles. Also once you load up the game, each day you unlock an additional Toy Box toy, and every 4th day you will unlock a new Adventure. It looks like this is a weekly deal, so you can be unlocking new stuff to play with fairly frequently. Another awesome feature is that you can load and sync your toy boxes to be accessible to your home console versions. As well as getting access to the weekly Toy Box Challenge winners' toy boxes, hand picked by Disney! 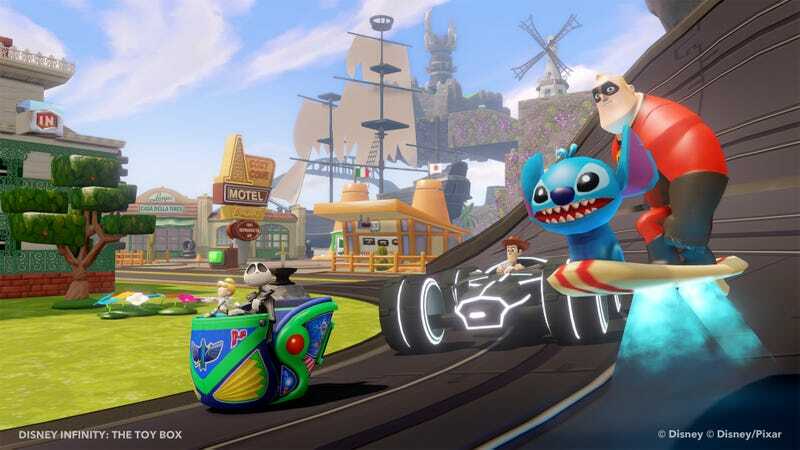 In the PC shop you can unlock access to play with more of the Disney Infinity cast, with a few noteworthy bundles available for purchase as well. $74.99 gets you the Ultimate Play Set Bundle, which includes all 6 Disney Infinity Playsets. You can also purchase them as singles for $14.99 each. Finally a reason to use these! The best part about all this? Those webcodes that come with the actual figures and play sets can all be redeemed to your account to unlock all of this content on the PC version. Overall it's a great improvement over the old buggy Toy Box only PC version, and finally allows you to play the actual game on PC. The controls still aren't amazing, but they've announced that controller support, as well as multiplayer is in the works for this version of the game. It also gives people a chance to try out the game without having to invest so much into the figures, and an option to players who have no interest in collecting them. My only gripe so far is that they don't have all the power discs on this version, and there's no way for me to activate my physical ones I have on PC. But because the PC version only has support for the Hexagonal toy box discs, you're not losing out on any benefits that the round ones provide, like extra exp or double damage. *To access any of the play sets you must purchase them. The download of the game still only initially has Toy Box access.